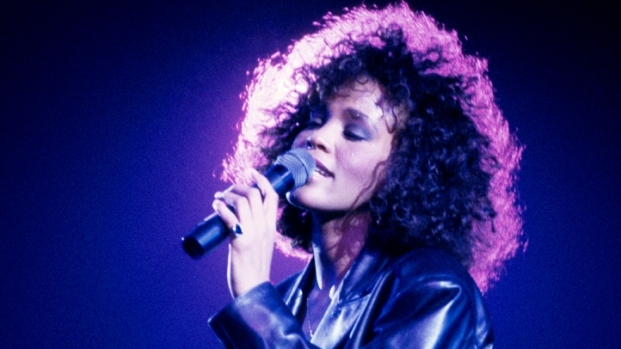 With Whitney Houston's death weighing heavily on the minds of the musicians at Sunday's Grammy awards, presenters and performers honored the fallen diva's memory but also celebrated the year's best music, just as they believed Houston would have wanted. 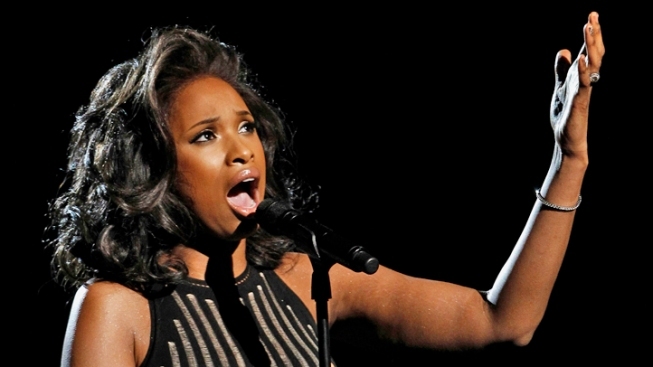 And while there were exuberant performances -- including a beautiful comeback by the night's top winner, Adele -- that shifted the mood from somber to lively, it was Jennifer Hudson's stunning performance of Houston's hit "I Will Always Love You" that the audience at Los Angeles' Staples Center likely will always remember. Standing before a single photo of Houston -- who died unexpectedly Saturday -- Hudson finessed and bellowed Houston' most popular song, appearing on the verge of tears but keeping composure and honoring the woman who had awarded Hudson a Grammy in 2009. She turned and threw a kiss to the portrait of Houston -- then joined by photos of all the other recording stars who died in the past year -- while the audience wildly applauded. Anticipation over tributes such as Hudson's likely helped make the Grammys broadcast on CBS a huge audience draw. An estimated 39 million viewers watched the show, a 41 percent leap over last year's show and the biggest tune-in since 1984, according to The Hollywood Reporter. 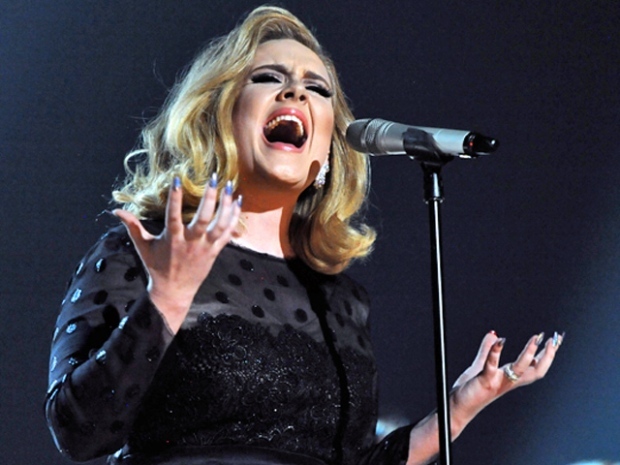 But viewers also were likley eager to see people such as British singer Adele, who performed for the first time in public since vocal surgery. She sang a by-all-accounts wonderful version of "Rolling in the Deep," her hit song about a bad break-up. She was the night's highest-profile winner, taking home six awards (including Record of the Year for for "Rolling in the Deep" and Album of the Year for "21") and making several charmingly spontaneous speeches. Her award tally was almost bested by rockers Foo Fighters, who took home five awards, performed three times during the night and made a memorable speech about the joy of making raw music outside a studio. Somehow, though, the awards seemed a bit beside the point on a night that was more about putting on an awesome concert. As in many recent Grammy shows, many of the performances were about pairing against type. In a much-anticipated reunion, the Beach Boys took the stage to sing "Good Vibrations" with Maroon 5 and Foster the People at their side, proving they still can create heavenly harmonies. Rihanna, in high-waisted leather shorts and a belly chain across her enviably flat belly, gave an electrifying performance of "We Found Love" and then took it down a notch to sing "Princess of China" with Coldplay's Chris Martin. Bonnie Raitt and Alicia Keys sang a duet tribute to Etta James, who also recently passed away. The Band Perry and Blake Shelton sang with Glenn Campbell. Then there were the solo performances: Katy Perry in blue hair and what appeared to be a bit of post-Russell Brand bitterness sang her new song, "Part of Me." The Foo Fighters rocked a crowd outside the Staples Center with "Walk," for which they later won Best Rock Performance. Chris Brown performed twice and danced up a storm. Throw in performances by Bruno Mars, Taylor Swift and Nicki Minaj (don't ask, something about exorcism), and it was the kind of night when even stalwarts like Bruce Springsteen and Paul McCartney managed to get overshadowed – even with a big-time finale of Springsteen, McCartney and Foo Fighters playing an "Abbey Road" medley. Kanye West and new dad Jay-Z won Best Rap Performance for "Otis" but didn't show up to receive it. Kanye also won Best Rap Album for "My Beautiful Dark Twisted Fantasy" and two awards for his song "All of the Lights." Cute college professor-like Bon Iver took Best New Artist and Best Alternative Album. Cee Lo Green took Best R&B song for "Fool for You." Keeping it all together was host LL Cool J, who set the tone for fun despite the sad context of Houston's unexpected death just a day before. "Although she is gone too soon, we remain truly blessed to have been touched by her beautiful spirit," he said, leading the audience in an opening prayer. "And to have her lasting legacy of music to cherish and share forever. "That said, welcome to the 54th Grammy Awards. This is music's biggest night to celebrate and remember." With a brief clip of Houston singing her biggest hit, "I Will Always Love You," the show got underway, with seemingly as much energy and drama as any other major award show. And a glance at the audience proved it was, indeed, business as usual: Nicki Minaj watched the show in a bizarre Red Riding Hood-like outfit, Lady Gaga was encased in netting and Fergie showed off her black underwear with a lace Versace dress – all just what you'd expect.